Valentin Khrushch - Ukrainian artist, one of the creators of the Odessa school of unofficial art. Valentin Khrushch (January 24, 1943, Odessa - October 24, 2005, Kimry, Tver region) - Ukrainian artist, one of the creators of the Odessa school of unofficial art. He was born on January 24, 1943 in occupied Odessa. He received his primary art education in the Odessa Art School. In the 1950s he studied at the Odessa Art School (teachers Zaitsev, Yegorov, Pavlyuk, Fraerman). Many critics believe that the "Fence Exhibition" organized by young artists Valentin Khrushch and Stanislav Sychev in 1967 "Sychik + Hrushchik" on the Odessa Opera Theater fence became the starting point for "Odessa nonconformism". This exhibition lasted only three hours. He took part in the organization of the first "apartment exhibitions" in Odessa. Since the late 1970s, name of Valentin Khrushch, as well as his colleagues of the "Odessa nonconformism" A. Anufriev, V. Strelnikov, L. Yastreb, V. Marinyuk, S. Sychov, V. Basanets began to appear in foreign catalogs and exhibitions. In 1979 he participated in the unofficial exhibition "Contemporary Art from Ukraine" (Munich-London-Paris-New York). In 1982, Valentin Khrushch moved from Odessa to Moscow. Last years, Valentin Khrushch spent in Kimry, Tver region, where he died from cancer on January 24, 2005. He was buried there in the St. Nicholas Church fence. 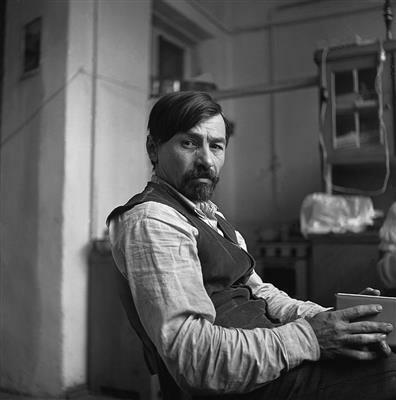 Valentin Khrusch was one of the central figures of non-conformist and underground art in Odessa, and later Moscow, emerging in the 1960s and 1970s. He was a major organizer of the so-called “open air” exhibitions that hung, sometimes only for hours, on fences along the street and later was the central catalyst in Odessa and Moscow behind the “apartment exhibitions”, shows of unofficial artists that took place in people’s homes. 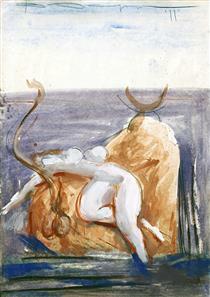 His works, which move seamlessly between figuration and abstraction, are enormously important to the history of Russian contemporary art, but due to their “unofficial” status, he remained better known in Ukraine and Russia than in the West, although there are major holdings of his works in a few American museums and private collections concerned with non-conformist art. He has been widely exhibited and collected in the countries where he worked, and has exhibited in Paris at UNESCO.